Women-owned businesses currently make up 39% of the 28 million small businesses operating across the United States, and this rate continues to rise. The U.S. Census Bureau shows that the number of women-owned businesses increased by 45% from 2007 to 2016, a rate five times faster than the national average. Despite this dramatically rapid growth, research continues to show significant gaps between women including men-owned businesses in several key areas including financing, revenue and hiring practices. Women-owned businesses employ nearly 9 million people and generate more than $1.6 trillion in revenues; however, they account for only 4% of the nation’s business revenues – a share that has remained steady for 20 years. 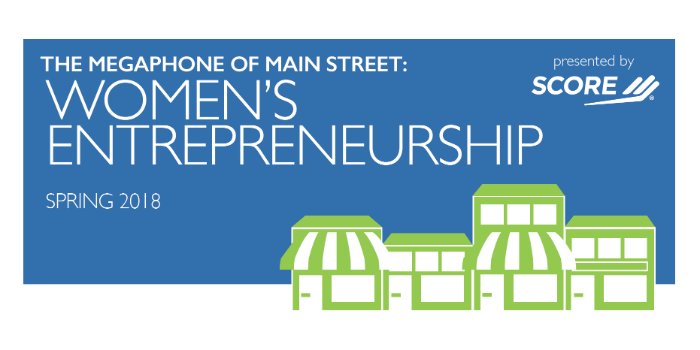 SCORE’s spring 2018 “The Megaphone of Main Street” data report focuses on women entrepreneurs—their successes, financing concerns and the impact of mentoring. Women are slightly more likely than men to start businesses. Among mentored businesses, women-owned businesses are as successful as men-owned businesses as measured by business starts, revenue growth, job creation, and number of years in business. Women are significantly more likely to launch businesses within the healthcare (10%) or education sectors (9%) than men (5% in both cases). In contrast, men are significantly more likely to start businesses in the construction and manufacturing industries (12%) than women (4%). 62% of women entrepreneurs depend on their business as their primary source of income. Among entrepreneurs seeking financing over the lifespan of their business, men were more likely to try to seek financing for their business (34% as compared to 25% of women). Among those entrepreneurs who sought financing in the past year, men were again more likely to obtain loans or equity financing than women (38%, versus 31% of women). Male and female entrepreneurs sought financing for similar reasons related to starting or growing their business, with the exception of one: Men were more likely than women to seek financing for the purpose of launching a new product (26%, as compared to 22%). Mentorship increases the likelihood of a business opening and staying open. Working with a mentor for five or more hours greatly increases an entrepreneur’s likelihood of business success. Women entrepreneurs experience greater success when they are mentored, regardless of their mentor’s gender.